We tend to not think very much about the internet in our everyday lives – in a way we just use it. It’s usually not until we’re disconnected from the digital world that we realize how dependent we really are to our internet-enabled devices. The invention of the Internet has had a profound impact on all of us: it transformed the way we connect with one another, how we find and share information, and to a large extent – how we live our day to day lives. In this blog post, we’ll take a closer look at how the internet shaped the world we know today. First we will take a look at some past statistics, then consider the present day trends, and finally extrapolate where the future of the internet will take us. And perhaps, by the end of this infographic, we will all have a greater appreciation for the internet. Internet adoption has increased at a very rapid rate over the last twenty years. Research studies have indicated that in 2017 nearly all adults in the United States will have some kind of interaction with the internet. This is quite interesting because if we look at the internet market penetration in the year 2000, only 52% of adults in the United States were using the internet. By the year 2008, that number had grown to 75%. And as of 2016, nearly 90% of all adults were regularly utilizing the Internet. 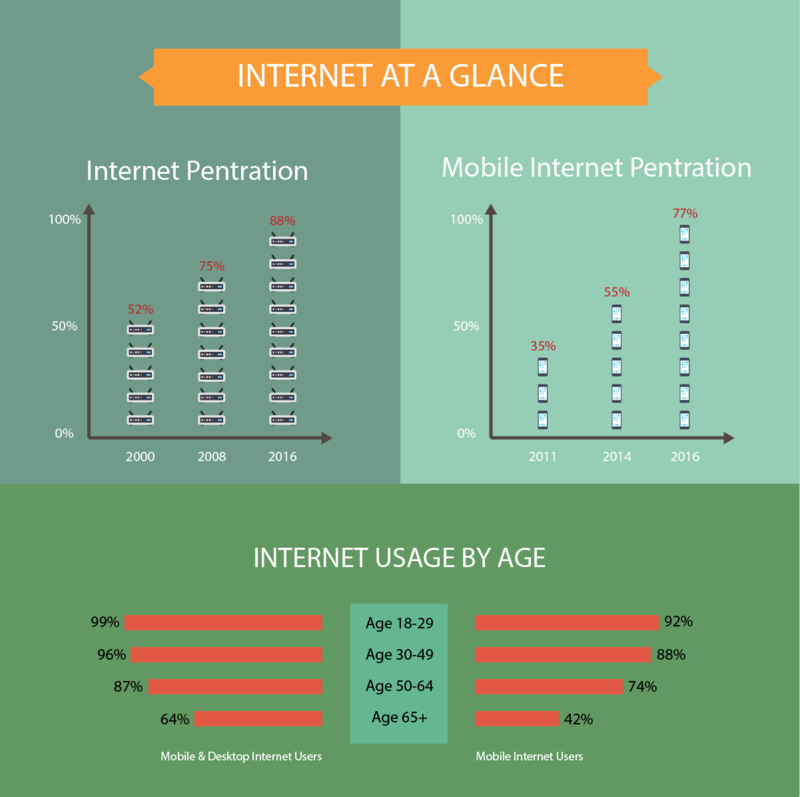 We see a very similar trend when we look at the statistics for mobile internet adoption. In the span of five years from 2011 to 2016, mobile internet adoption had increased from 35% to 77% of the entire adult US population. A different study that analyzes internet usage by age revealed that nearly all adult between the ages 18-64 are internet users. Not surprisingly, the largest demographics of non-internet users originated from adults who are older than 65 years old. 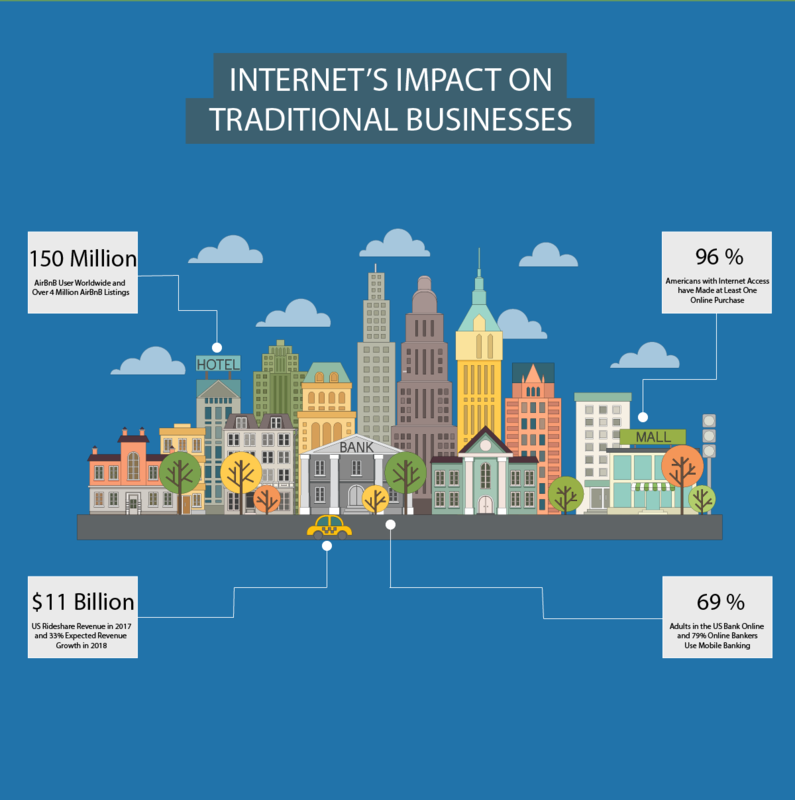 By the early and mid 2010’s, the high internet penetration enabled internet based technology companies to develop innovative and customer-centric ways to address consumer needs. Although many of these technological breakthroughs made the quality of life better for individuals, these technology startup companies also had some profound negative impacts on many traditional business models. AirBnB, the very popular home hosting and sharing platform, has disrupted many hotel/lodging businesses all around the world. Currently there are over 150 million AirBnB users worldwide and over 4 million AirBnB listings and this number is expected to continue to grow. Similarly, the popular ridesharing companies, Uber and Lyft, have carved out significant market-share in the transportation industry. In 2017, ride sharing companies generated approximately $11 billion in revenue and is expected to grow 33% in 2018. In the retail space, the quick rise of E-commerce has forced many traditional brick and mortar stores to go out of business. Recent studies have shown that 96% of adults with internet access have made at least one online purchase in their lifetime. This statistic indicates that consumers clearly enjoy the conveniences of online shopping. Similarly, our banking institutions have also seen a big shift due to the technological changes made possible by the internet. Less and less banking customers are now visiting their local banking retail branches, instead many prefer to do their banking online. 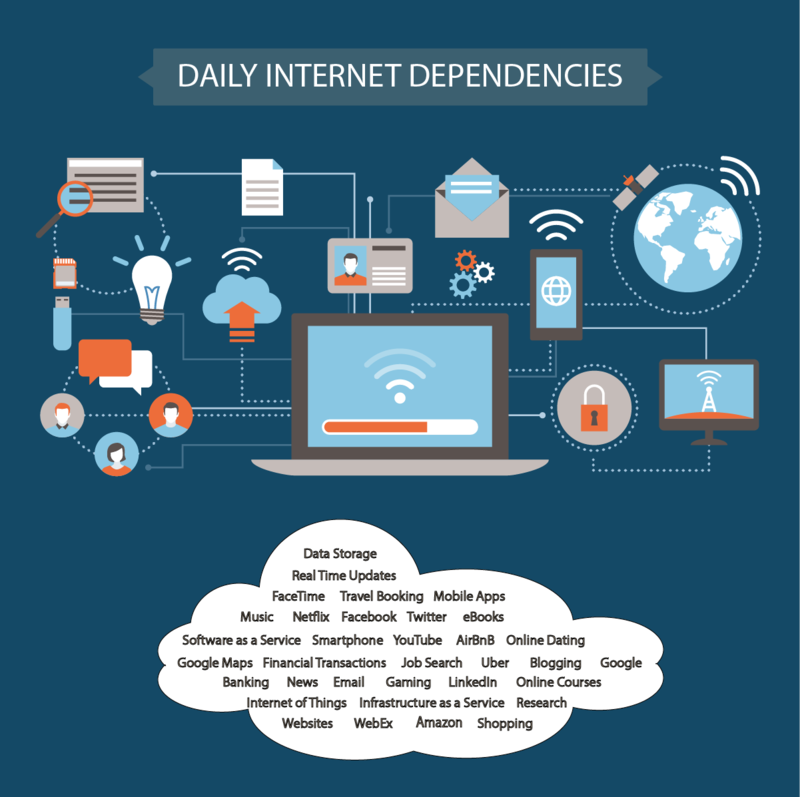 In our day to day lives, we almost never think about how dependent we are to the internet but the truth is for most of us we would not be able to make it through a single day without touching the internet in some capacity. To illustrate this, let’s consider some of our everyday activities. Most of us depend on the internet for work related activities such as: checking our email, using lync/skype to communicate with one another, screensharing through WebEx, and maintaining sales leads on Salesforce. We also use the internet during our leisure time to: watch videos on YouTube and Netflix, connect with friends on social media through Facebook and Twitter, video chat on FaceTime, browse the internet, and shop online. Additionally, we use the internet to research and gather information on Google, we use Google Maps on our phone as a GPS to find directions, and use online courses to gain knowledge. This list is far from comprehensive but it becomes apparent that internet is very much a part of our everyday lives. It’s pretty clear that the internet has transformed the world in many ways over the past several decades but what changes will the internet bring in the future? The latest research studies suggest that the next big thing will be the Internet of Things – the interconnection of every day objects with the internet. Broadly speaking, the Internet of Things can be categorized into three main groups: 1) Smart Home Devices 2) Wearable Technology 3) Machine to Machine devices. The Internet of Things is already upon us in the form of smart devices such as Smart Lightbulbs, Smart Watches, Smart Home Automation, etc – as IOT devices become more widely adopted, we as consumers will be able to manage our assets in more informed ways and make better overall decisions. Recent studies have shown that there will likely be over 200 billion IOT devices by the year 2020. 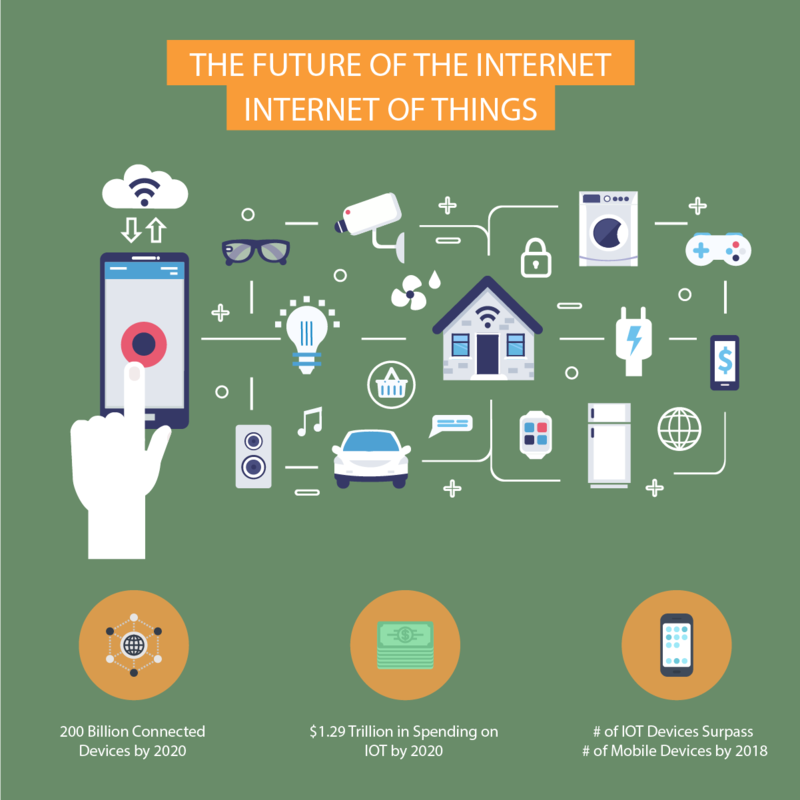 In fact, IOT is growing at such a fast rate that it is predicted that there will be more connected devices than there are smartphones by the year 2018. From a monetary perspective, IOT spending is expected to exceed $1.29 trillion by 2020. With that said, IOT is certainly a subject we should all be paying attention to.